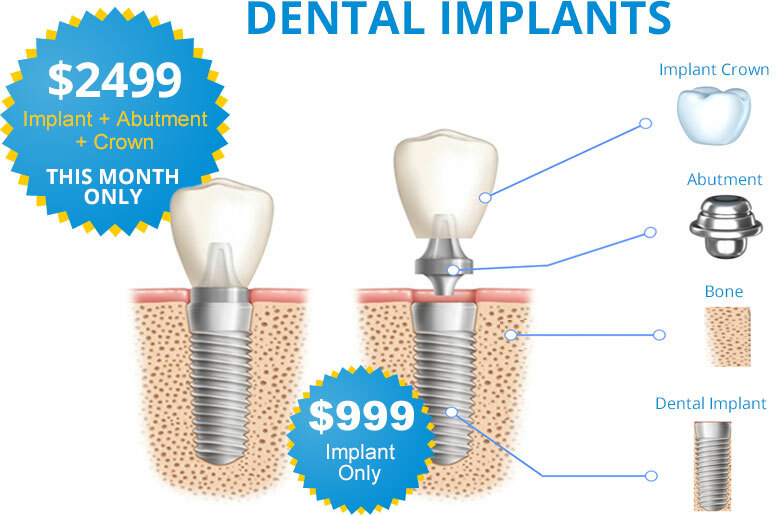 Affordable Dental Implant Special Starting $2499! No Running around town to multiple Dentist. Dental implants are surgically placed into the jaw bone. A titanium post is used as the ‘tooth root’. This is secured into the jaw bone, which stimulates bone grow to hold it in place. Once the post is healed, a permanent dental crown is placed on the post to create the new tooth that looks and functions like a natural tooth. Implant dentistry has come a long way since it first began. The new technology and techniques used at Pure Dental Health give us a high reliability and success rate with our dental implants. In general, dental implants have a 95-98% rate of success, making them a great option for replacing missing teeth. Most people that have missing teeth can be good candidates for dental implants. To determine if dental implants are right for you, we invite you to come to Pure Dental Health for a consultation and exam. Our highly experienced implant dental experts will do a thorough exam of your oral health and bone structure. We will also consider your medical history and other factors to determine if you are a good candidate for this highly effective dental restoration option. Many people sustain their dental implants for the rest of their lives. These replacement teeth are surgically implanted and permanently adhere to the bone in your jaw. With good oral health care and routine visits with our dentist at Pure Dental Health, you can potentially retain your dental implants for decades. What Are the Benefits of Implants Over Dentures? The obvious benefit of dental implants over dentures is they are permanent. They will not slip or move when you eat, talk or smile like dentures can. They look natural and function like your real teeth. Another benefit is that dental implants can help reduce bone loss in the jaw, helping retain the structure in your face for a more youthful appearance. Dental implants do require an investment, but this can be offset by some insurance plans. At Pure Dental Health, we have financing and payment options to help our patients fit dental implants into our patients’ budgets. Call to find out more about the cost and financial options available. What Makes Pure Dental Health the Best Place for Dental Implants? At Pure Dental Health, we put our patient’s health and comfort before anything else. We are implant dentistry experts with experienced dentists and assistants to care for your new smile. You will also enjoy the comfort of our office, with valet parking, wireless noise-canceling headsets, an internet bar and many other amenities to make each visit to our office enjoyable. If you are ready to explore the possibility of dental implants, come see us at Pure Dental Health. We are your source for excellence in implant dentistry in the greater Atlanta area. Contact our office today to schedule your consultation to learn more about how dental implants can transform your smile and improve the quality of your life. To learn more about dental implants, or to schedule an initial consultation to discuss your options, contact Pure Dental Health today. We believe that once you come in to meet and discuss your dental needs, learn about the Pure Dental process, and understand the pricing and options…you’ll make the decision to go with us-. Our doctors have extensive education and experience in implant placement, restoration, and recovery. We handle all phases of the implant process in-house, without the need to refer you to another office. Our doctors and dental care team have been recognized for providing exceptional patient care and communication before, during and after treatment. (678) 666-3642. We are ready to help!